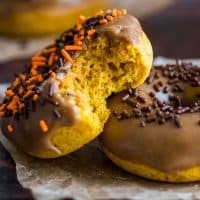 These Pumpkin Donuts with Maple Glaze are moist, lightly spiced, and delicious. Preheat your oven to 350°F and lightly grease your donut pan. In a medium bowl, whisk together flour, baking powder, cinnamon, ginger, nutmeg, cloves, and salt. In a large bowl, whisk together pumpkin puree, brown sugar, egg, milk, and butter. Add the dry ingredients to the wet, and stir until just combined. Prop a gallon-sized disposable bag open over a large cup, and transfer batter to the bag. Squeeze out most of the air, and use scissors to snip off one of the corners. "Pipe" the batter into your donut pan, filling 3/4 full--this should make exactly 6 donuts. Bake for 9 to 11 minutes, until donuts are fluffy, and spring back if you press down on the top with your finger. Allow to cool in the pan for 5 minutes, until cool enough to handle, before transferring to a wire rack to finish cooling completely, about 15 minutes. Once your donuts have cooled, combine butter, brown sugar, and milk in a small saucepan over medium heat. Cook until butter is melted, and sugar dissolved. Remove from heat and whisk in corn syrup and maple extract. Add half of the sugar, and whisk until incorporated before adding the rest. Whisk until smooth. Discard excess glaze* and allow the glaze on the donuts to set for 5 minutes before eating. *This recipe makes about twice the amount of glaze that will actually end up on the donuts (to ensure you have enough to get a smooth finish when dipping). The approximate nutritional information reflects this. Donuts are best the first day, but can be kept in an air-tight container at room temperature for 2 to 3 days.